← Netflix Instant Picks for February, 2014: 18 Current Reviews! 3-1/4″x5″x1/2″ This little USB 3.0 hard drive is a powerhouse with a full terabyte of space. My desktop computer is seven years old. It’s a HP Pavilion a6000n PC and it works great. But then just like pets, all computers eventually meet their demise. I don’t know when mine will go up in smoke (may it be the hard drive or motherboard) but I don’t want to lose important data. What can I do? There are online services that will backup your data to the cloud. They all require an annual fee that is usually at least $50/year for the low-end packages. I don’t like that option. I like to keep it local. Besides, I already pay enough monthly fees (garbage collection, oil burner service, Netflix, phone, water filtration system, etc.). So, let’s not go there. I decided to investigate an external and portable hard drive that was reasonably priced. Fortunately it was amazingly easy to find just what I wanted! Since it was around Christmas time I was able to find all sorts of deals. 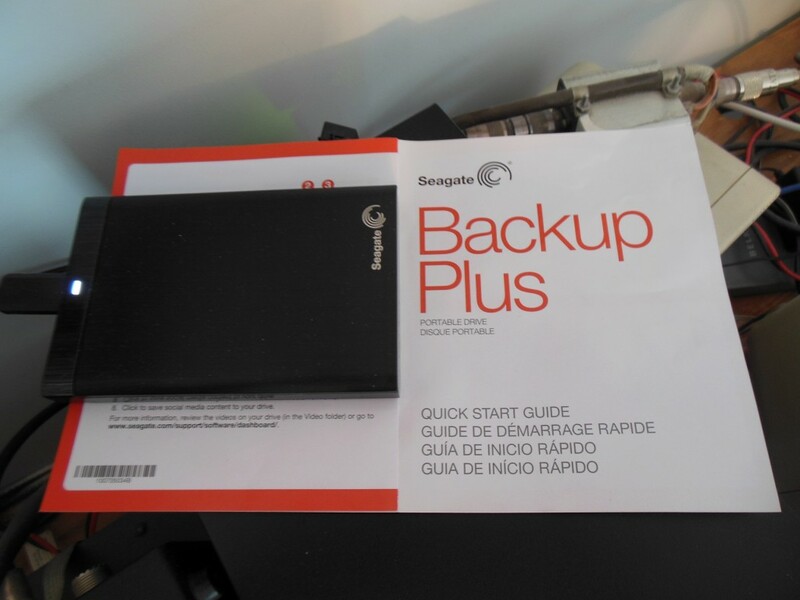 The one that best suited me was the Seagate Backup Plus. Seagate is a trusted brand that has been around for a long time. This small USB 3.0 external hard drive that had 1 terabyte of storage was being offered by Amazon.com for only $59.99 (presently back up to $79.88). Since my entire desktop hard drive has only 250 MB of space, 1 terabyte sounded like enough. Unfortunately the only way to maximize the throughput speed of the device was to connect it to a USB 3.0 port. I only had USB 2.0 on my antiquated desktop. This was easily solved by purchasing a separate USB 3.0 PCI-E Express Card, the Anker Uspeed USB 3.0. It came with 4 USB ports and just required an open PCI-Express slot and a 5V 4-pin power source. My desktop had both. So for an additional $19.99 I gained 4 fast USB ports. The description of the Seagate was not exactly clear about the capabilities of the included backup software. Fortunately the drive came with a Seagate Dashboard Software installer. I installed the software. The Dashboard starts off by enabling you to make a complete backup of your desktop hard drive. Thereafter the software does continuous backup. This means that any changes that you make on your computer hard drive will be immediately reflected on the Backup Plus. You don’t have to schedule anything. It is all taken care of. And yes, I did check to see if the program was actually keeping an accurate record of changes on my drive. Indeed it was. Everything is mirrored on the Seagate. The drive also comes with special options that allow you to backup some of your social media items. The one I was interested in was the Flickr backup. I provided the drive with my logon information and now it seamlessly keeps a backup of all 1,795 photos that I have stored there. If Flickr were to disappear tomorrow I would still have every photo I ever uploaded to it. The software will perform a similar function for Facebook and YouTube. I have not tried them yet (I have a YouTube account but not Facebook). You can also use the Dashboard to upload items to these services. So, to sum up, I think this Seagate (STBU1000) is one heck of a deal. I have it sitting on top of my HP Pavilion where it remains very cool. There is a little LED to let you know it is running and that is it. It doesn’t even get hot. The best part of the deal was that Amazon was running a special when I made my purchase. They said that I could deduct $50 from my purchase if I took out an Amazon charge card. I did take out the card. The total purchase for the drive and the USB ports came to $29.98. They even included the USB cable for the drive! What a country. This entry was posted in Modern Technology, Occasional Commentary and tagged 3.0, Amazon, Anker, Backup, drive, hard, plus, portable, Seagate, TB, terabyte, USB, Uspeed. Bookmark the permalink.